Connecticut Public Television > Inside CPTV > Take a Cruise with CPTV Create This Weekend! Take a Cruise with CPTV Create This Weekend! Step aboard the SS Create and wave goodbye to winter as Create’s travel experts set sail on a worldwide adventure! Don’t miss special “Winter In, Cruise Out” programming on Saturday, January 19 and Sunday, January 20 on CPTV Create. 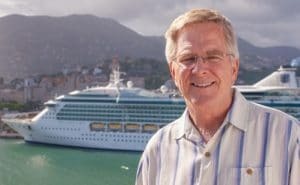 On his Mediterranean adventure, Rick Steves explores the ins and outs, and pros and cons, of cruising. Joseph Rosendo cruises across the Canada-U.S. border in Alberta; Rudy Maxa tours the Turkish coast in a traditional wooden boat; and Music Voyager‘s Alvaro Fernández experiences the beauty of the Amazon on a boat cruise. Don’t miss these and other cruise-themed travel programs throughout Saturday and Sunday, only on CPTV Create!